What does your perfect day look like? If you ask me this question, it doesn’t take me long to answer. It would be anywhere in nature. Preferably with many, many wild animals. Lucky me! In Brazil I had many of those perfect days. I remember all those wonderful birds in the mountainous region of the Itatiaia National Park. Or the Guiana dolphins South of Rio de Janeiro. 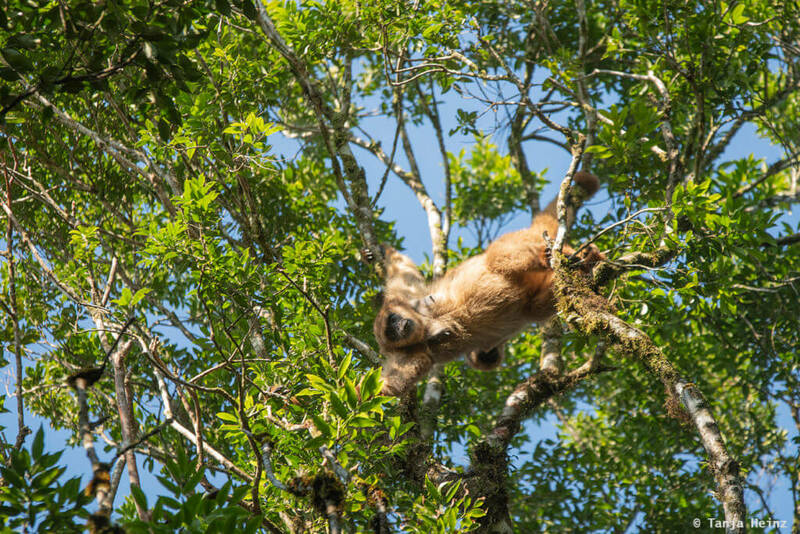 But also the Golden lion tamarins in the Atlantic Forest. If I look back on my journey, I had so many wonderful wild animal encounters. Each encounter was so special and precious for me. I could not be more grateful for all these opportunities I got. This blog post is again about a very, very special animal encounter I had in Brazil. And that was with the Southern muriquis. If you follow this blog, then you probably know that I had already searched for the Northern muriquis in a forest area in Minas Gerais. My search was not successful there. However, as I could not stop thinking about the muriquis afterwards, I was searching online for more information about where to observe muriquis in Brazil. 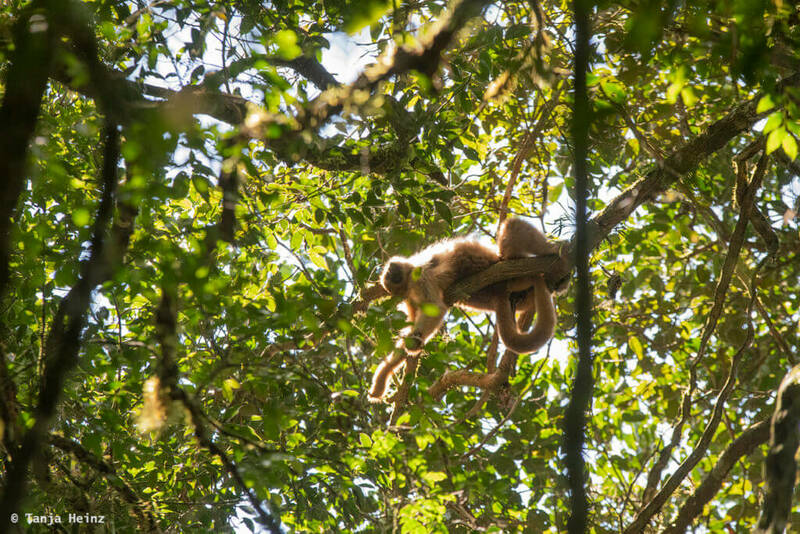 Thereupon, I became aware of the Associação Pró-Muriqui where it is possible to participate in a “Muriqui Eco Tour”. 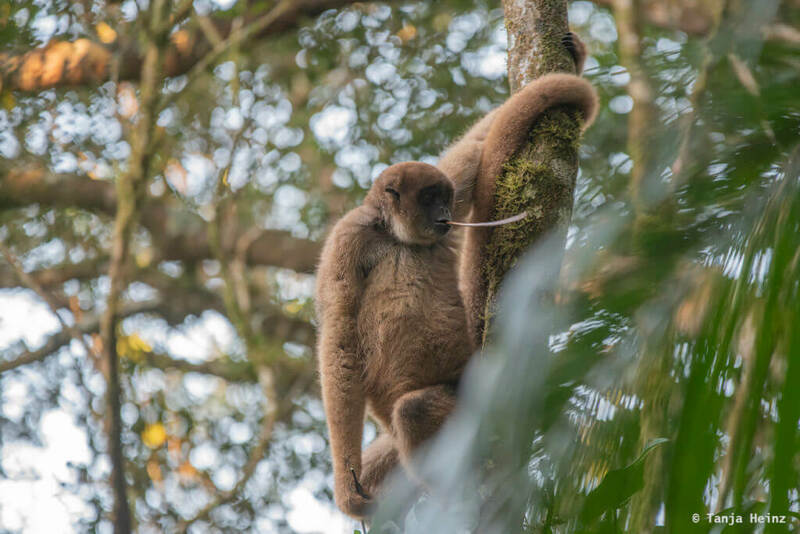 In this blog article I will tell you more about my participation in this “Muriqui Eco Tour” of the Associação Pró-Muriqui and my encounter with the Southern muriquis. To give you first a little overview about the muriquis in Brazil, there are two species of them. On one side, there are the Northern muriquis (Brachyteles hypoxanthus), and on the other side, the Southern muriquis (Brachyteles arachnoides). Both are endemic to Brazil. That means, they live only in the Atlantic Forest in Brazil and do not occur in any other place of the world. 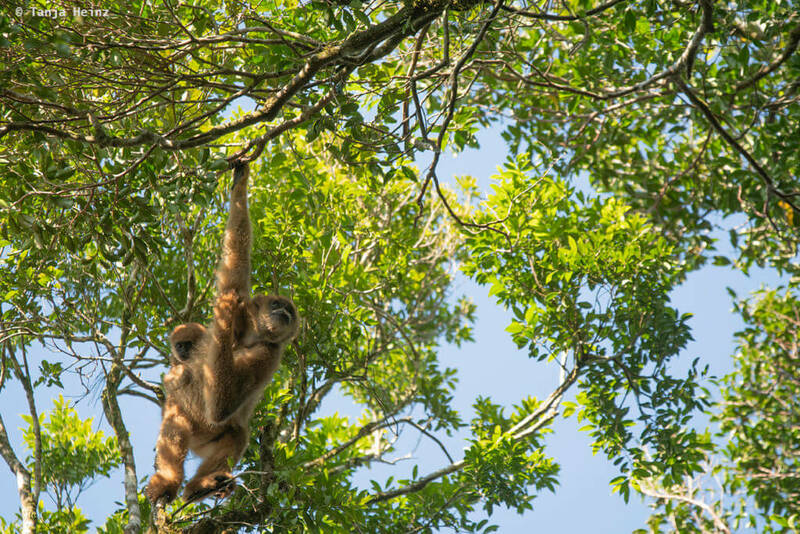 Another interesting fact is, they are the largest monkey species of the New World. 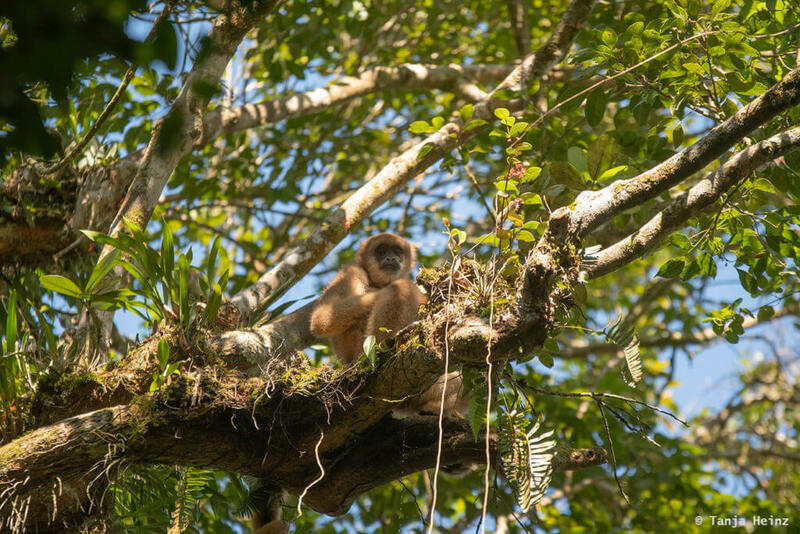 Muriquis are also known as „woolly spider monkeys“ as they are in the same family like „spider monkeys“ and „woolly monkeys“. This is a little bit confusing, as muriquis are no hybrids of spider and woolly monkeys. 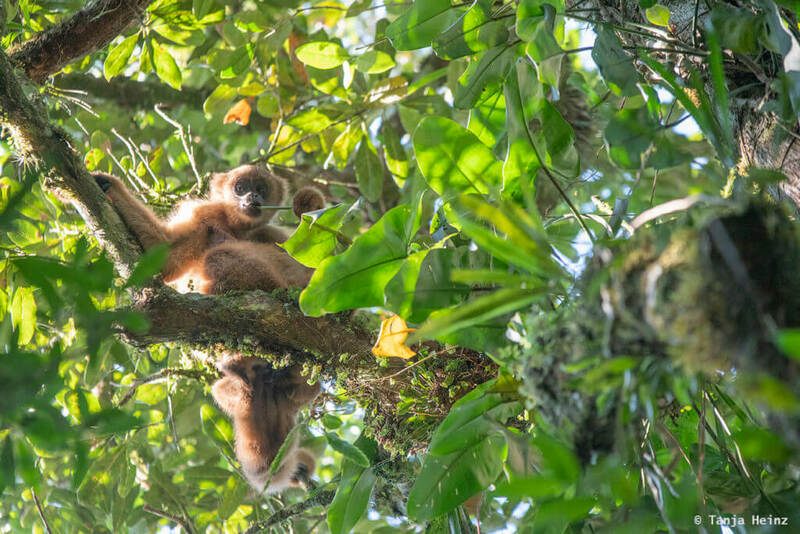 However, spider, woolly and woolly spider monkeys belong to the family Atelidae which also includes howler monkeys. All these monkeys have one characteristic in common. They all have a long prehensile tail. Since the 90s, the Northern and the Southern muriquis are recognized as two separate species. They fairly look alike, however, the Northern muriquis have a small thumb which is not present in the Southern muriquis. Furthermore, Southern muriquis have a black face while the face of the Northern muriquis is individually mottled. Where do Northern muriquis live? If you want to visit the Northern muriquis, then you have to go to the Southeast of Brazil as the geographic range of Northern muriquis extends from Minas Gerais over Espírito Santo to Bahia. 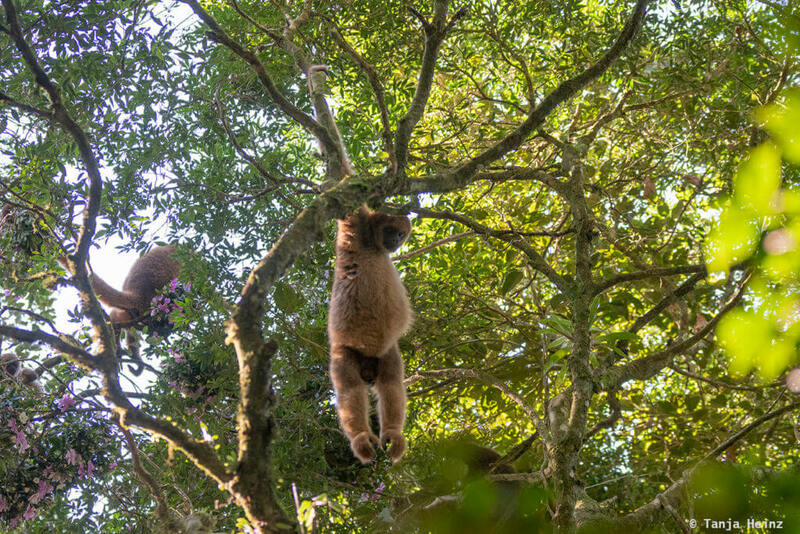 However, the Northern muriqui is „critically endangered“ according to the IUCN and there are only about 850 individuals left in the wild. Furthermore, the population trend seems to be decreasing. Consequently, there are not many places where it is possible to observe Northern muriquis in the wild. I have visited one of these places in Minas Gerais. It is a protected forest area where conservationists and scientists work together to preserve the Northern muriquis and its habitat. The name of this protected area is the RPPN Feliciano Miguel Abdalla Natural Reserve. About 230 individuals live in this protected forest area. It is the largest known population of Northern muriquis. If you want to know more about the RPPN Feliciano Miguel Abdalla Natural Reserve and how you can visit this place, please check my previous blog article. But just bear in mind, the Northern muriquis are „critically endangered“ and you have to avoid any action that could stress or harm the animals. Honestly, before visiting the RPPN Feliciano Miguel Abdalla Natural Reserve, I was not sure if I should go to a place where a critically endangered animal lives, as I do not want to stress any animal with my presence. However, I trust the people on site that they make the right decision to let visitors observe the muriquis for some time or not. I believe, they would not let more people in, if it would stress the animals in any way. The people there are primarily scientists and conservationists, and thus, not focused on promoting mass tourism. And by the way, when we were at the RPPN Feliciano Miguel Abdalla Natural Reserve, we did not meet any other visitor in the forest. So it is by far not a mass tourism location. Where do Southern muriquis live? Southern muriquis, in contrast, occur further South in Brazil. There are extant populations in São Paulo, Rio de Janeiro and Paraná, but might occur even in Southern Minas Gerais. 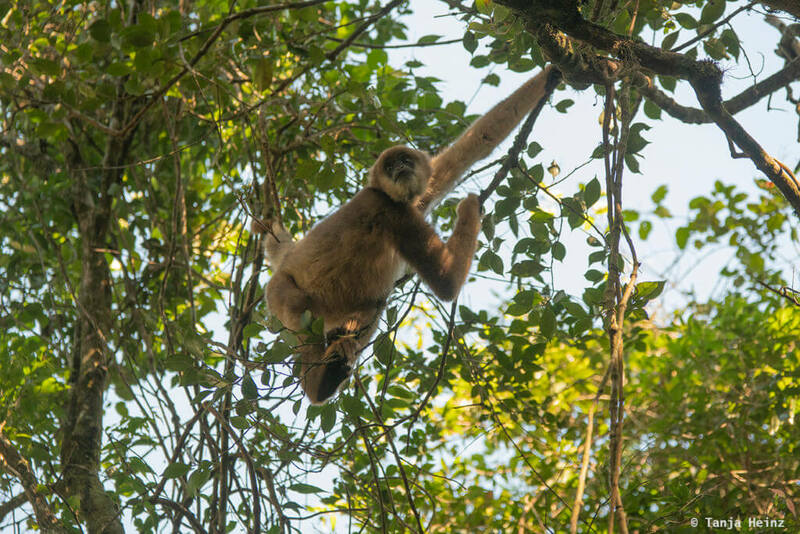 However, Southern and Northern muriqui populations are geographically isolated, and thus, there is no interbreeding between both species. The situation of the Southern muriquis looks a little bit better when compared to the Northern muriquis. But still, Southern muriquis are „endangered“ according to the IUCN. It is estimated that the whole population consists of about 1300 individuals and the largest population occurs in the state of São Paulo, that is, in the Carlos Botelho State Park. 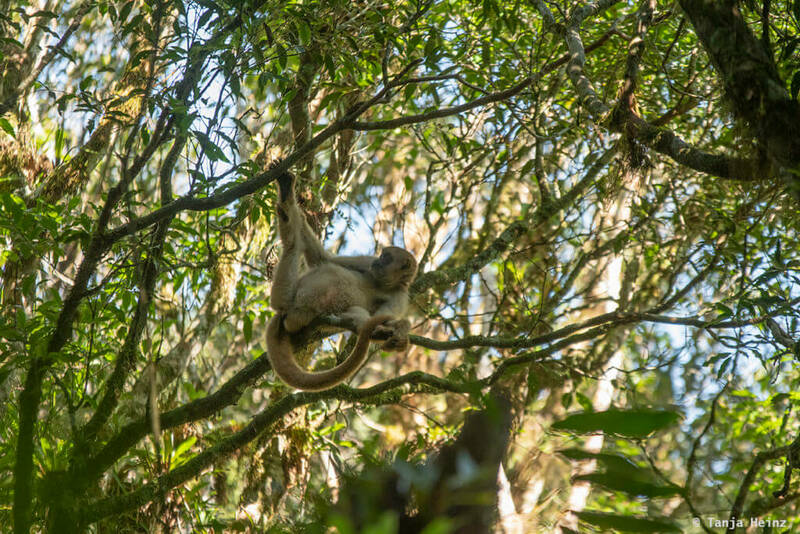 And exactly in this state park the Associação Pró-Muriqui takes small groups of about maximal five visitors on “Muriqui Eco Tours” to observe a group of Southern muriquis in their natural habitat. Humitily, because the animals just left me in awe. Is there anything more wonderful than these animals? Gratitute, because I got the opportunity from the Associação Pró-Muriqui to visit the Southern muriquis. And hope, because I met very committed and highly motivated people who do everything for the conservation of the Southern muriquis. 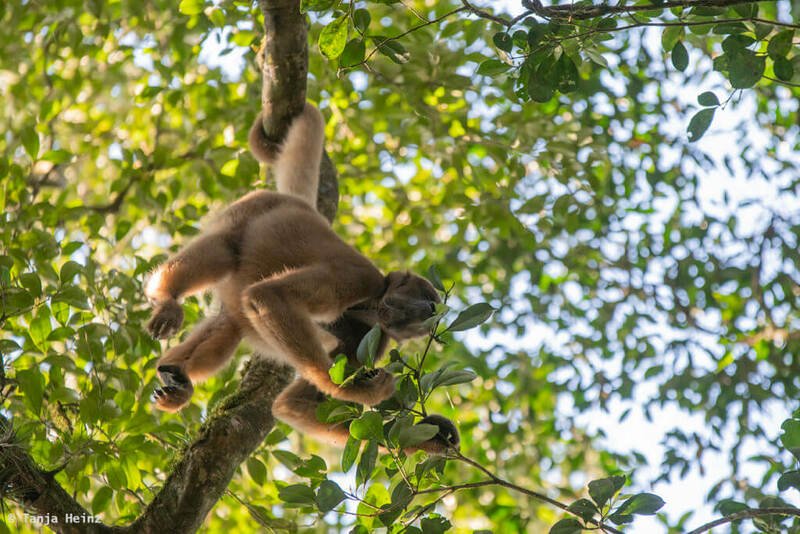 In the following paragraph, I will tell you more about this special animal encounter in the Brazilian Carlos Botelho Sate Park in São Paulo. 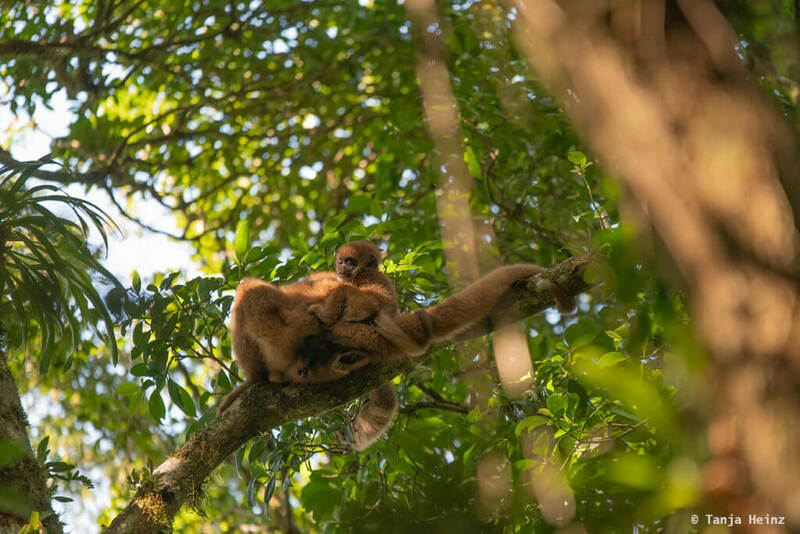 If you want to visit the Southern muriquis with the Associação Pró-Muriqui then you most probably will see the animals, as the people there know very well where to find them. Importantly, it is prohibited to enter the part of the forest where the Southern muriquis live. You can enter it only with the Associação Pró-Muriqui. 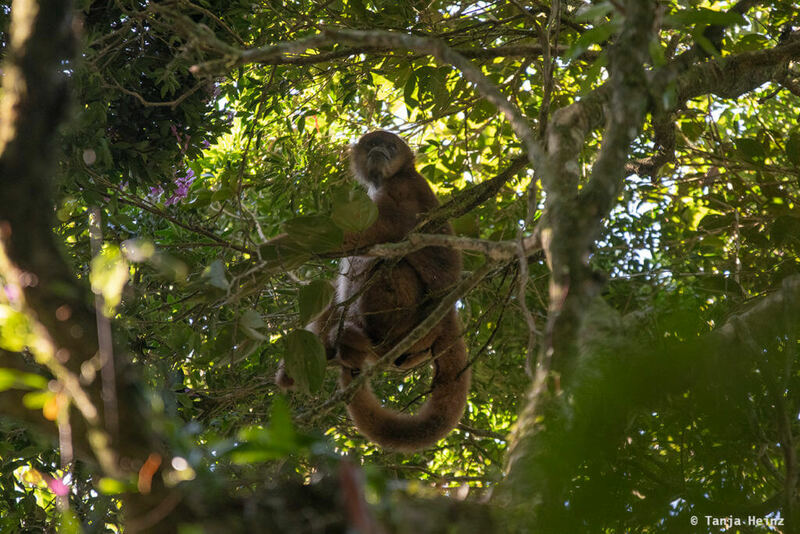 However, you have to wake up very early in the morning to join the team of the Associação Pró-Muriqui on their daily monitoring tasks. It is necessary to be at the sleeping site of the Southern muriquis before sunrise and wait quietly in the dark forest for them to wake up. If we wouldn’t have done it this way, the Southern muriquis might have fled frightened after waking up. If they move away quickly, it is difficult to follow them through the densely forested and mountainous terrain. So we waited quietly in the dark forest for the Southern muriquis to wake up. When I wasn’t trying to look through binoculars, the sound of the forest and the beautiful early morning light got my full attention. And finally, after some more waiting, the moment arrived. 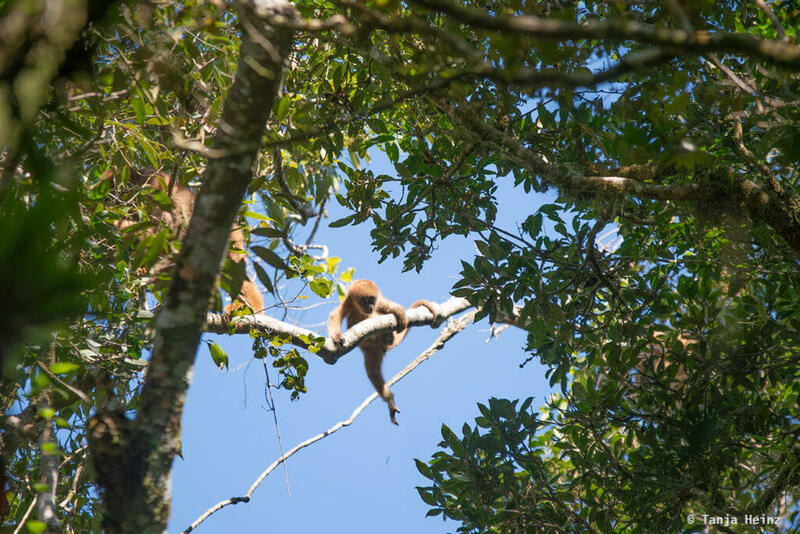 We spotted some muriquis in the trees moving on their sleeping sites. 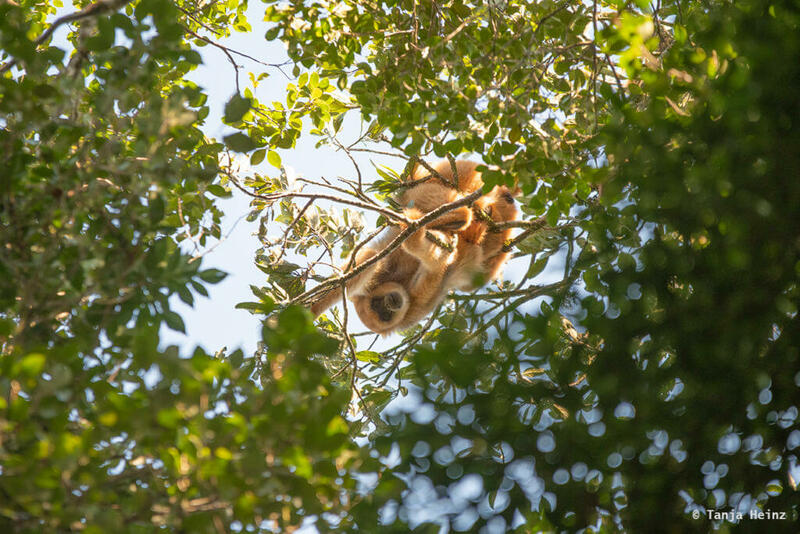 As you can see on the photograph, Southern muriquis sleep in the upper canopy of a tree. Muriquis are arboreal animals. That means, they live in trees and forests are their natural habitat. Muriquis are also diurnal, and thus, are active during the day and sleep at night. Their day begins after sunrise and ends before sunset. Most primate species are diurnal and there are only few primate species that are nocturnal or active during the night, respectively. 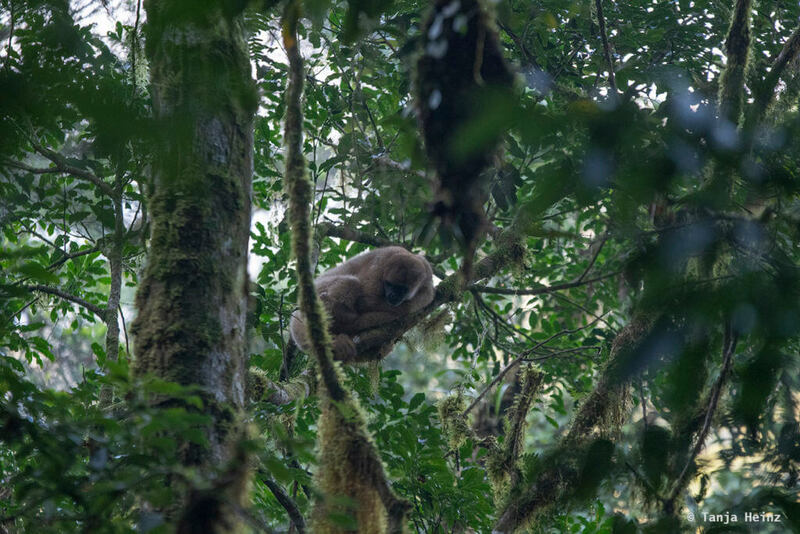 Typical nocturnal primate species in South America are night or owl monkeys. However, I haven’t met any night monkey on my journey through the South of Brazil, and thus, I will not go deeper into this now. 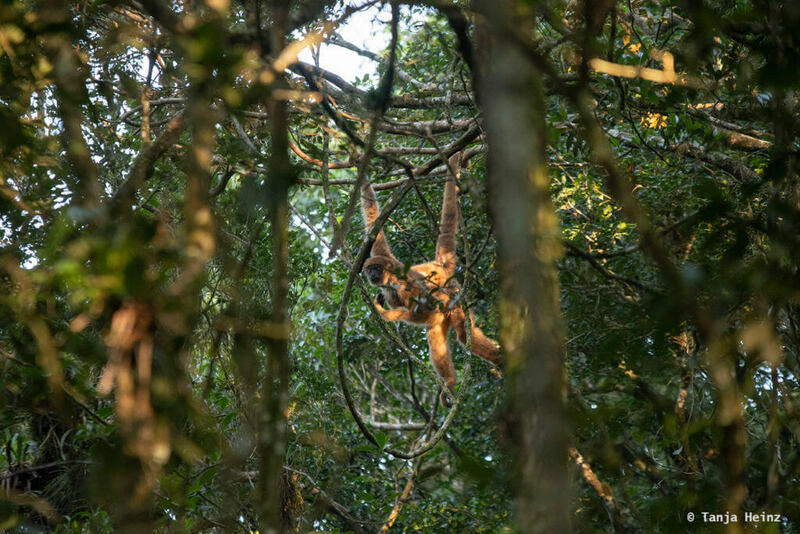 When the light was getting more and more brighter and warmer, we could spot the first more active muriquis swinging from branch to branch with their long limbs and long prehensile tails. 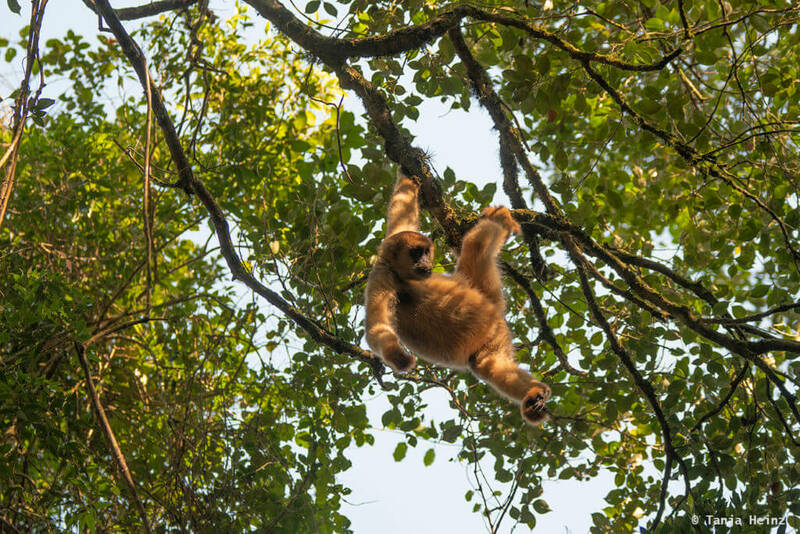 Where was the Southern muriqui going? We couldn’t see it. 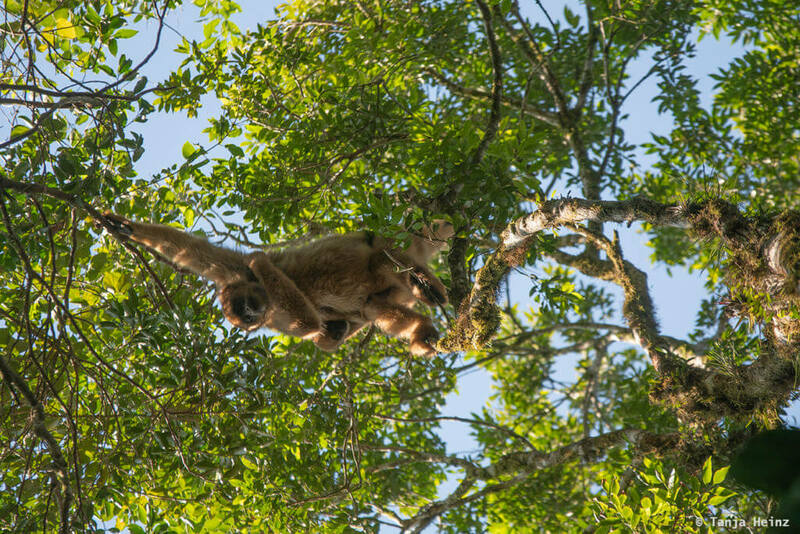 The muriqui disappeared again in the dense forest as fast as it appeared. 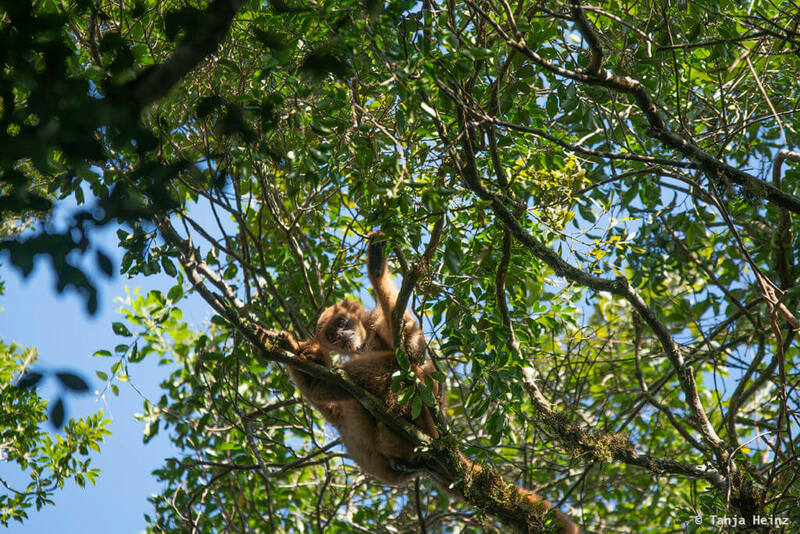 Instead, I observed another Southern muriqui which made itself comfortable on the trunk of a tree. Hadn’t they just got up? Anyway, the day was beautiful and I was excited about what the Southern muriquis will show me on that day from their life. Some muriquis were further away. I was looking at their appearance. Their fur is yellow-brown and covers their whole bodies – except their black faces. There is no sexual dimorphism among Southern muriquis. That means, males and females do not have a different appearance. Males are only a little bit larger than females. 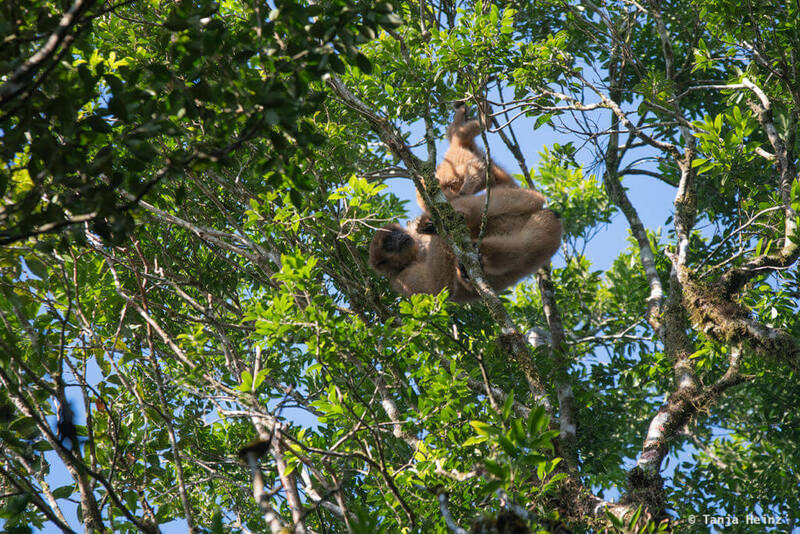 In the following two photographs you can see a male on the left and a female on the right side. While observing them, I became aware of how long their limbs and prehensile tails are. Northern muriquis and all other members of the family Atelidae as well, have these long prehensile tails. 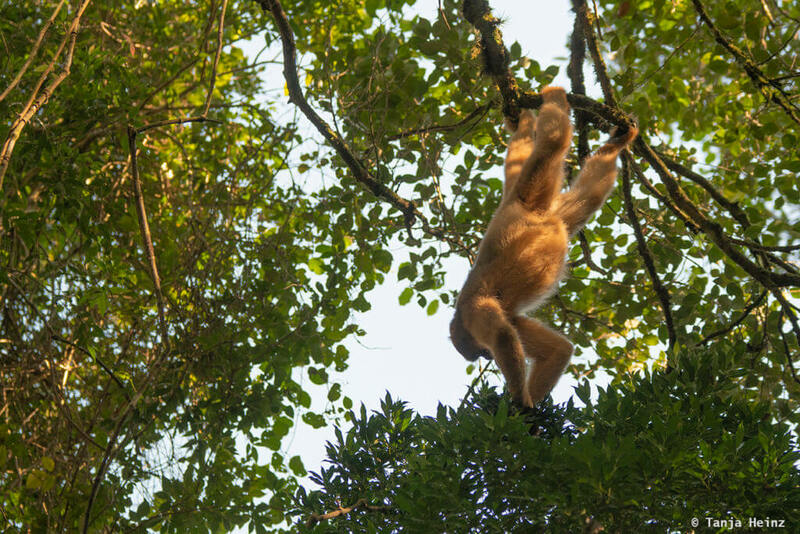 Prehensile tails are specialized tails that enables a monkey to grasp and hold on to a branch. A prehensile tail is like an extra arm or leg. By wrapping around a branch, muriquis can hold tightly on to a branch. 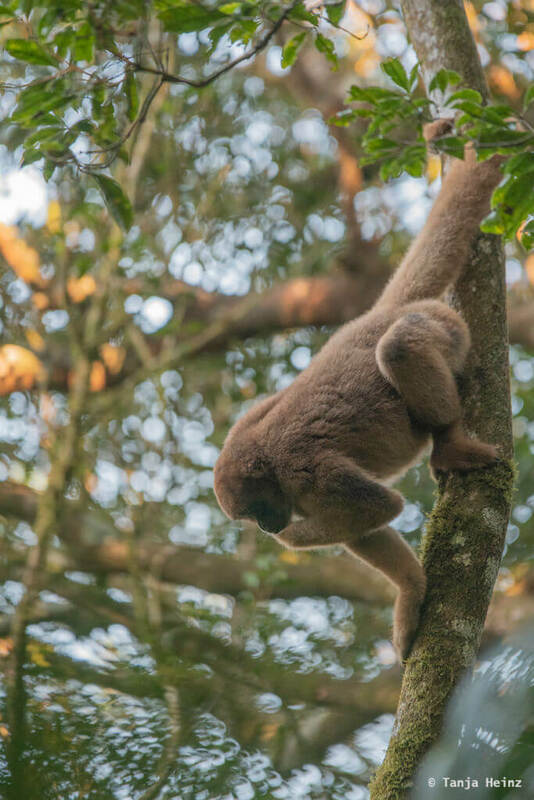 A long prehensile tail allows the muriquis to move agilely among the trees. 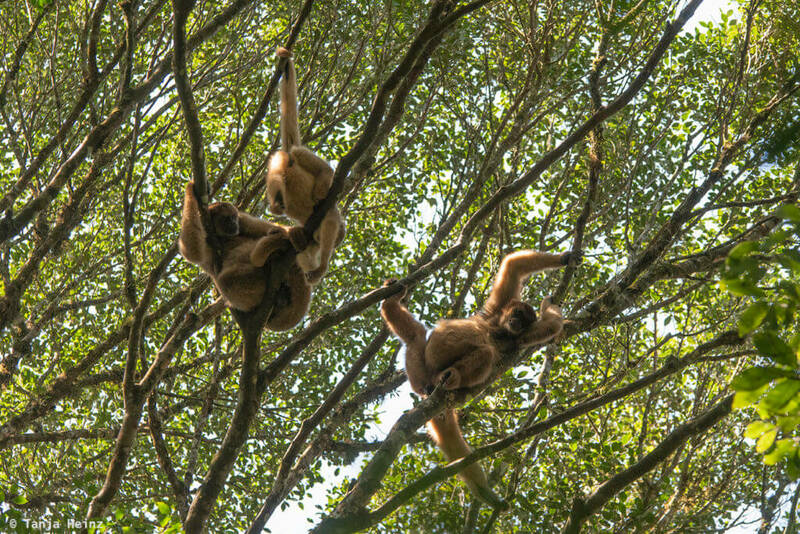 They use their prehensile tail for suspensory climbing (hanging from a branch) or brachiation (swinging with arms from branch to branch or tree). They use their prehensile tails in different situations. But also when moving from tree to tree. 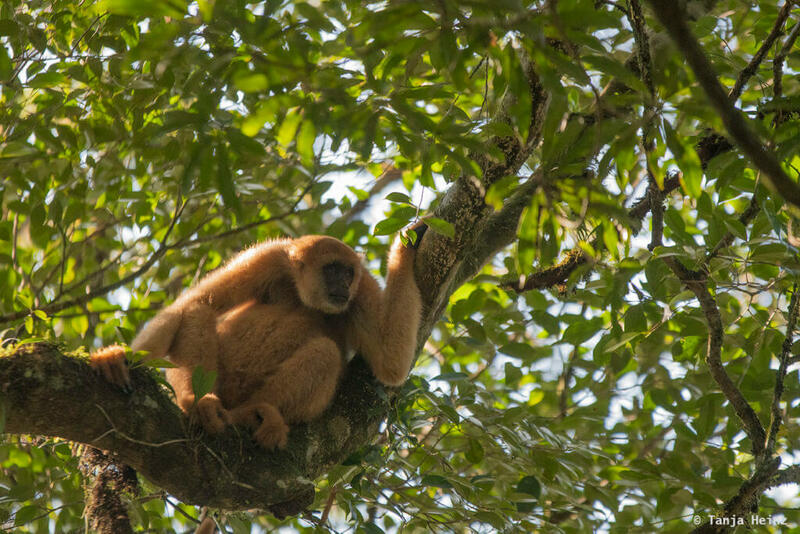 Southern muriquis use their prehensile tail as well when they have a rest in a tree. Most of them remained in the shadow of the forest, but some of them climbed up a tree and, as it seemed to me, to bathe in the sun. 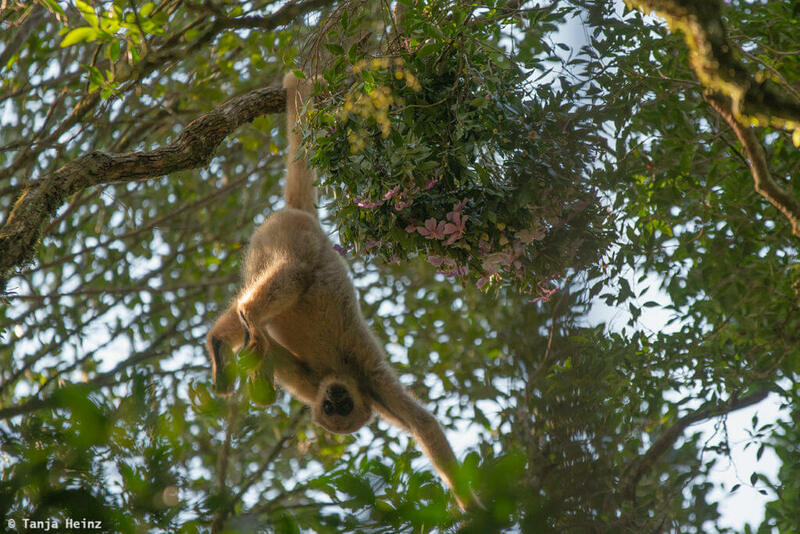 Like the following Southern muriqui. 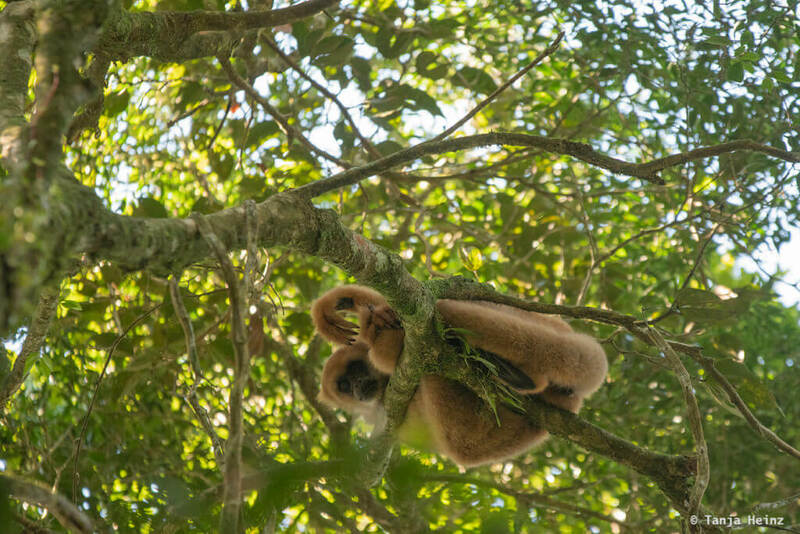 I found it quite curious to observe the different resting postures of the muriquis like the one of a muriqui which was lying on its back on a branch in order to let the sun shine on its breast. 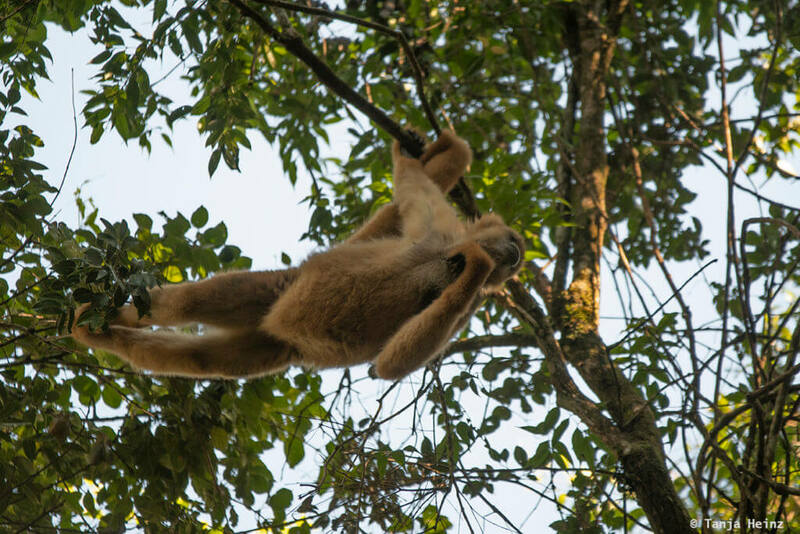 With a size between 55-60 cm and 58-61 cm for females and males, respectively, and a weight of about 9.5 kg and 12 kg (Source: The Pictorial Guide to the Living Primates) , I was wondering in some moments, how could a Southern muriqui get that high like the one in the following photograph? This just shows me how agile Southern muriquis are among trees. While some were bathing in the sun like the two in the previous photographs, others were looking for food. One special observation was, when one of the Southern muriquis reached some flowers. 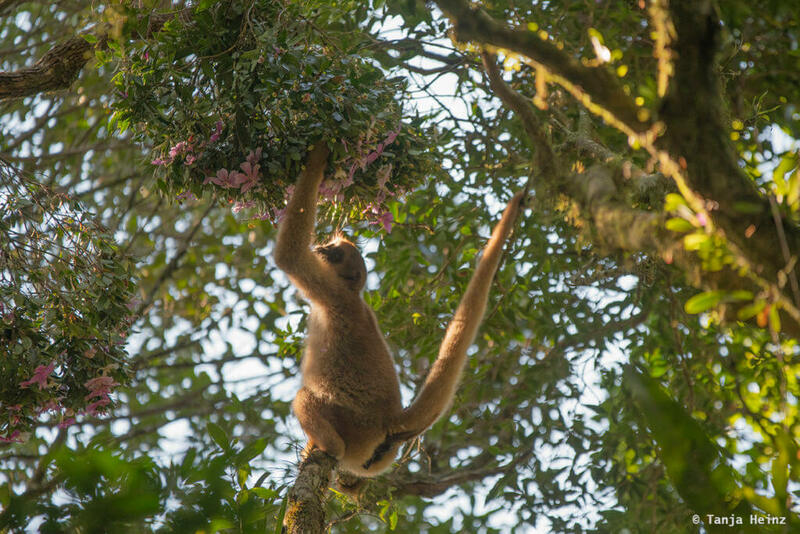 The combination of the pink-colored flowers and the incident light with the muriqui exploring its new found food source, was a wonderful opportunity for me to photograph the animals. 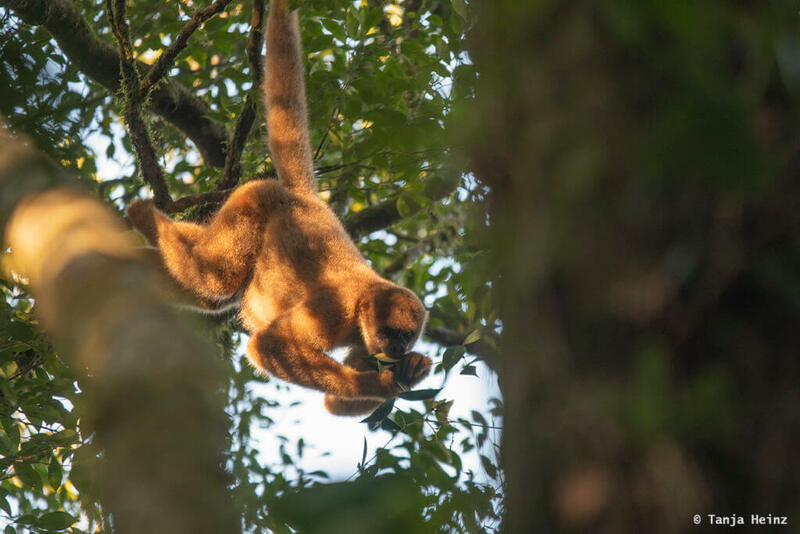 And of course, this Southern muriqui was using its prehensile tail while feeding by wrapping its tail around a branch. 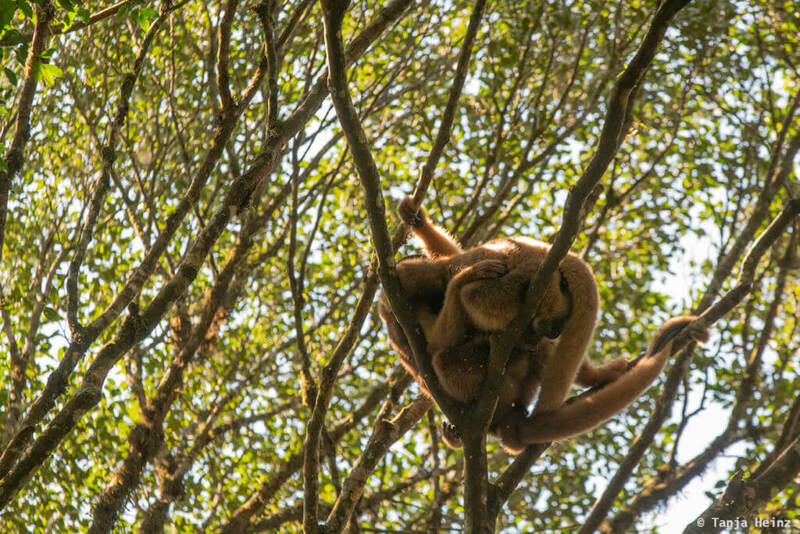 The muriqui remained in this position for a few moments. But maybe it was not the best position or food source as this individual began moving again. And then I observed one of the Southern muriquis typical behavior: hanging from the branch of a tree with its prehensile tail and exploring the flowers. I tried to keep myself calm, although I was very excited about this observation. After that it was looking exactly into my direction. Did it notice me? Was it the clicking of my camera? 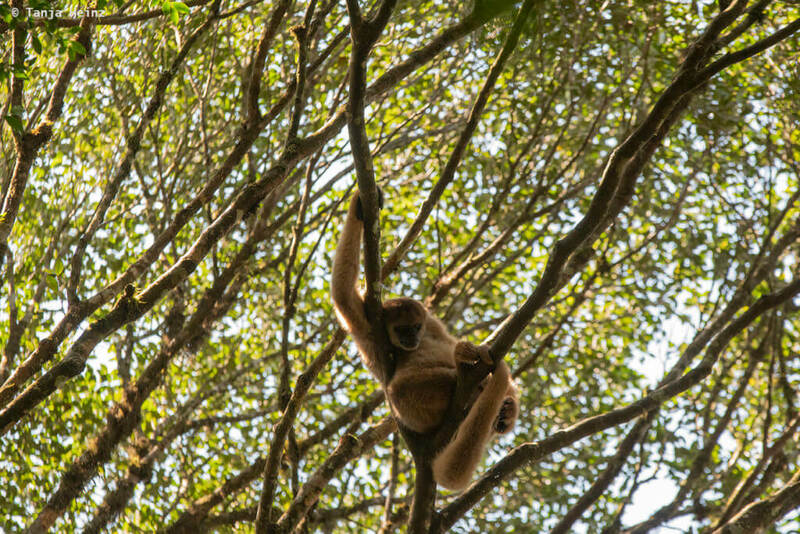 The muriqui reminded me of lying aside my camera for a moment. Although I was taking quite many photographs, I had to remind myself not to look through the lenses of my camera all the time. I should not forget to just be there and observe the animals. 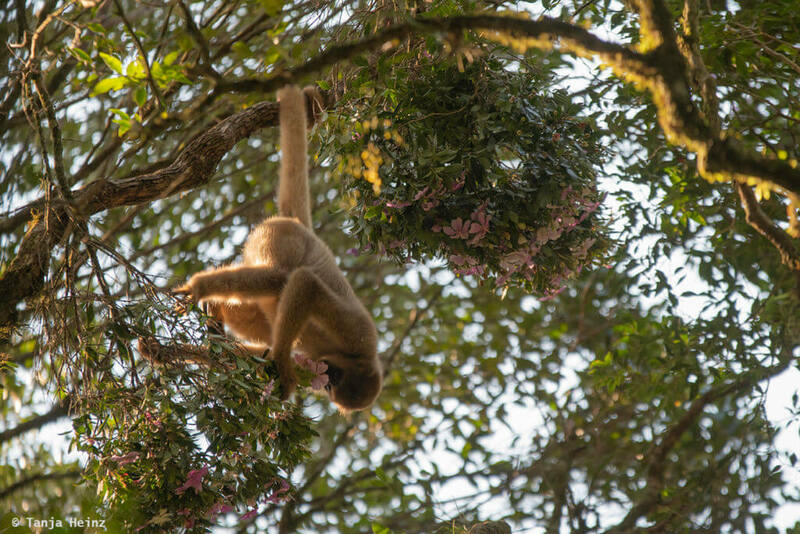 I also thought, maybe it was not its favorite food source as the muriqui did not continue exploring the flowers? The diet of Southern muriquis consists mainly of leaves, but they also feed on fruits or seeds at times. 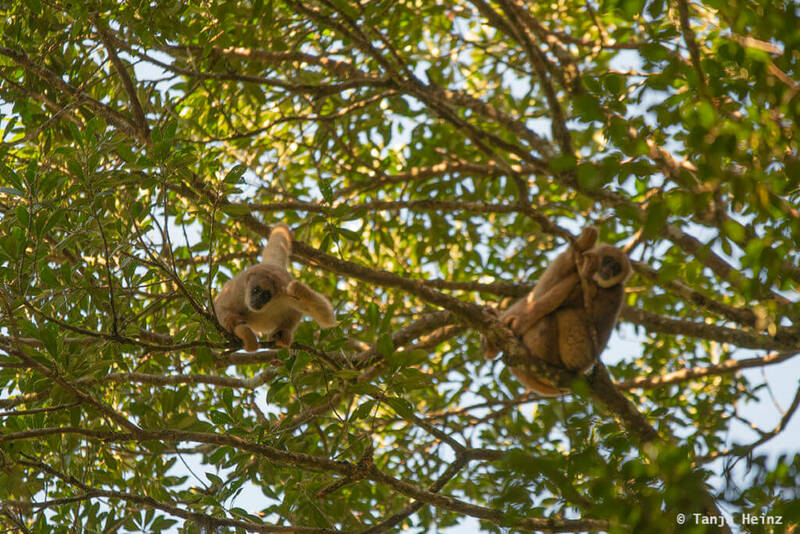 Southern muriquis in the Carlos Botelho State Park feed primarily on fruits. 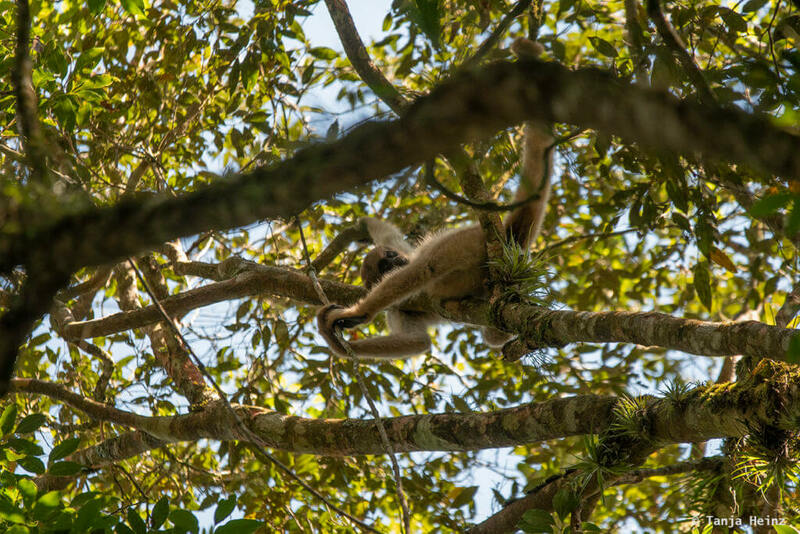 In the following photograph is a Southern muriqui feeding on leaves in its typical posture. When I was observing some other individuals, I was not sure if they were feeding or just chewing on something. Some of them had sticks in their mouths. 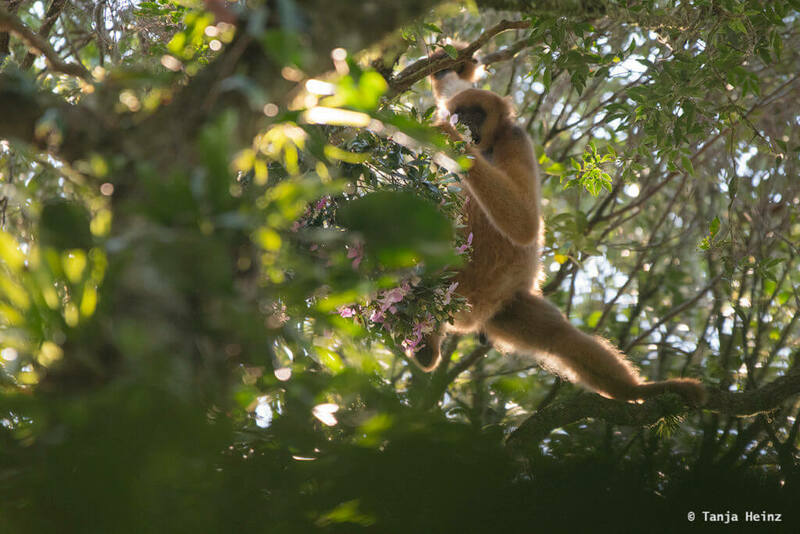 There was one adult Southern muriqui which I saw several times as it had an offspring, and thus, was easier to distinguish from others. I remember the Crested capuchins from the Reserva Natural Vale. There I saw a mother with an offspring. 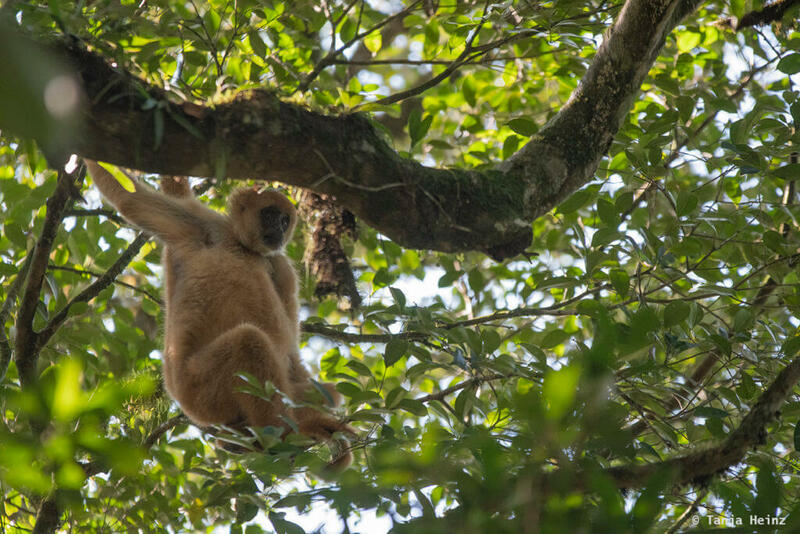 However, while the Crested capuchin monkey fled (of course I did not follow her), the Southern muriqui mother seemed quite tolerant to our presence. In one moment we saw the mother moving from one tree to another one with its offspring on the back. Sometimes the mother made herself comfortable on a branch, while her offspring was moving away. Apparently she was not overprotective despite of our presence. It was very amusing observing both of them. 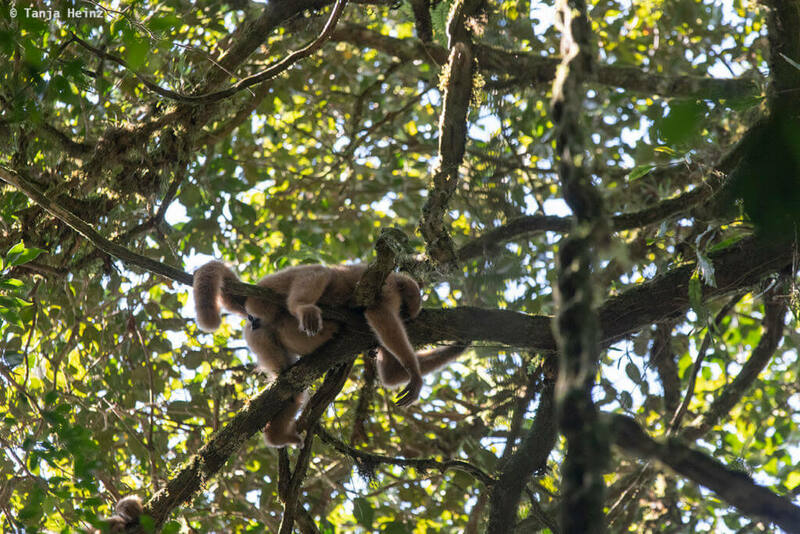 Especially when the little Southern muriqui was practicing its climbing abilities. When the mother was looking for food, the young hold itself on the back. By the way, Southern muriquis are promiscuous, and apparently, there is only little aggression among males to get access to females (but this might not always be the case). Southern muriquis live in multimale-multifemale groups with 8 to 45 individuals in one group (26 on average). Usually, females associate with females and males with males within the group. 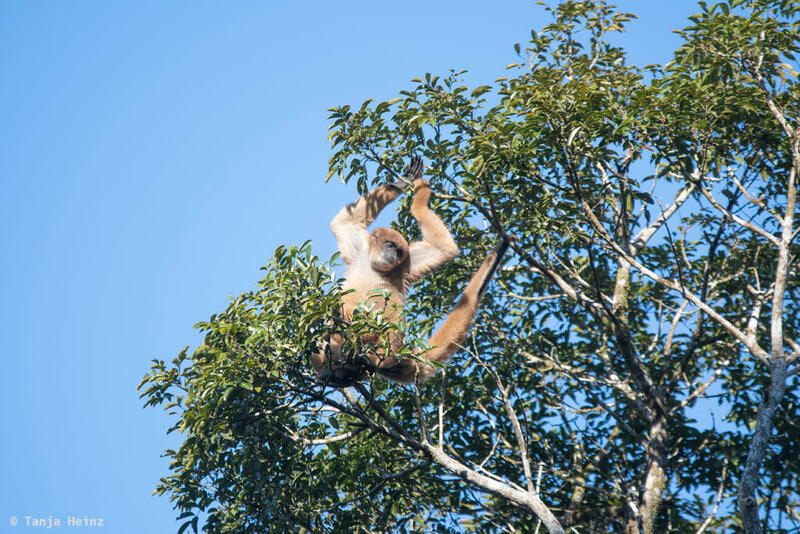 While males remain in the group were they were born, females leave their natal group at the age 5 to 6.5 years (Source: The Pictorial Guide to the Living Primates). 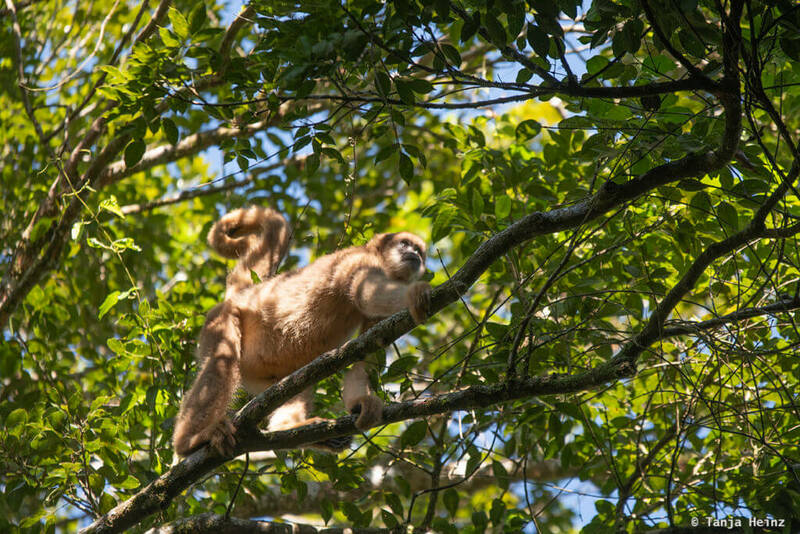 When I was searching for more information about the muriquis in general before my journey, I often came across the expression „hippie monkey“, because of the muriquis’ apparently non-aggressive behavior. During that day in the Atlantic Forest, indeed, we did not observe any aggressive behavior. 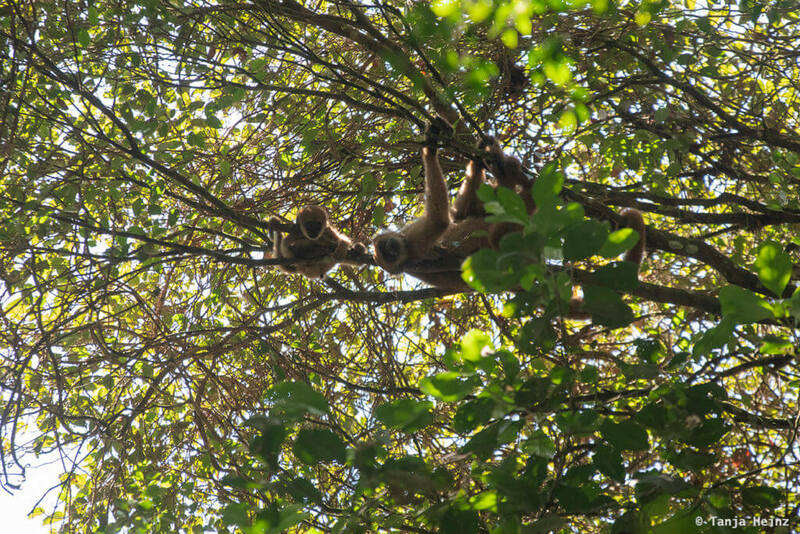 We saw them peacefully together in the forest canopy. I even saw some observations which are very typical among muriquis. Embracing each other for reassurance or as a greeting hug. Muriquis do not show much social grooming, but rather embrace each other. In the following photograph you can see this behavior between two males. Nevertheless, I was in the Carlos Botehlo State Park with the muriquis only for just a few hours. And thus, my observations are not representative. Although the muiquis are seen as a rather peaceful primate species, aggressive behaviors can occur among muriquis. One aggressive behavior of male Southern muriquis even ended in the death of one male in January in 2008 in the Carlos Botelho State Park. However, this was the first seen lethal attack in a long-term study of muriquis. When I was walking through the forest observing the Southern muriquis, I could hardly imagine a lethal attack among them. They were even quiet when moving. Sometimes they appear of a sudden and I just had to turn around. Approaching midday, the Southern muriquis became more and more inactive. Some were sitting quietly, but still awake on a branch. Or climbing around some branches. 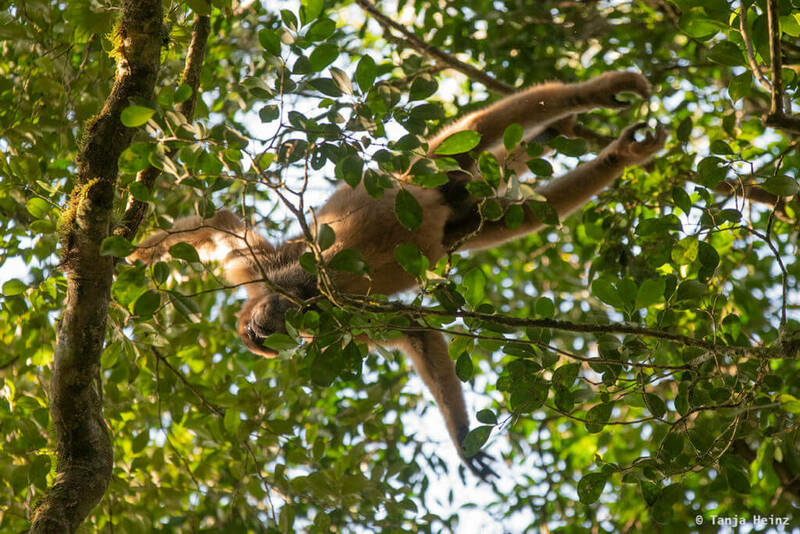 One individual found a good position for some time by hanging from a branch and holding itself with just one arm. Nevertheless, time was moving and the muriquis became sleepy. Including the mother and her young. Some individuals had already found a sleeping position, but were still awake. Others had already fallen asleep. While the muriquis were sleeping at midday, we stood or sat on the forest floor observing them. This also gave me some time to think about the Southern muriquis. If we consider that less than 10% of the original Atlantic Forest remains, there is a reason to be concerned. Both for the Atlantic Forest itself and all the animals that rely on these forests as a habitat. 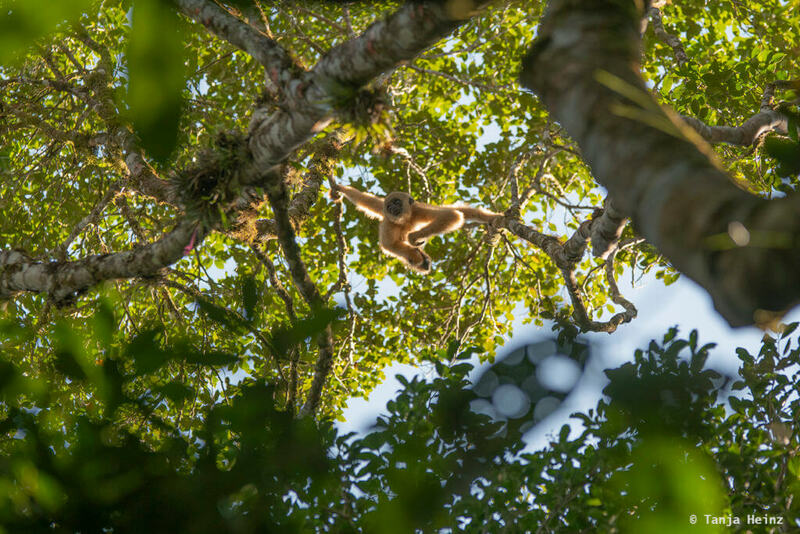 According to the IUCN some of the threats Southern muriquis are exposed to are logging, agriculture, but also recreational activities and tourism. For me as a traveler it is very important to leave behind as little of an environmental impact as possible. 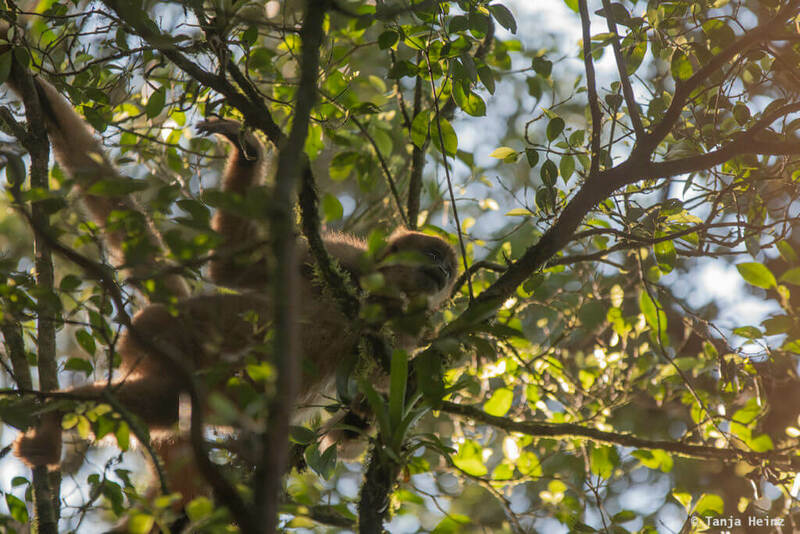 Therefore, I try to travel as slowly as possible, but also I try to support institutions on my journey like the Associação Pró-Muriqui by participating in their “Muriqui Eco Tour”. 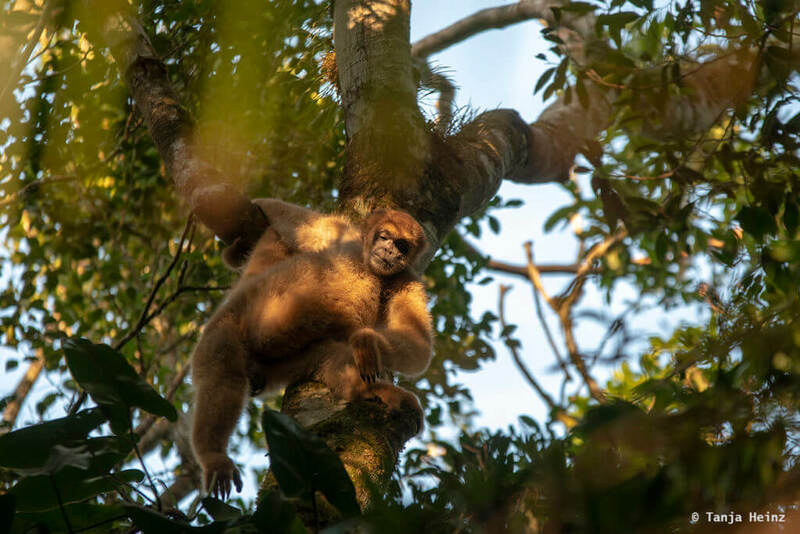 I have witnessed how dedicated, enthusiastic and caring the people from the Associação Pró-Muriqui watch out for the Southern muriquis in the Carlos Botelho State Park. 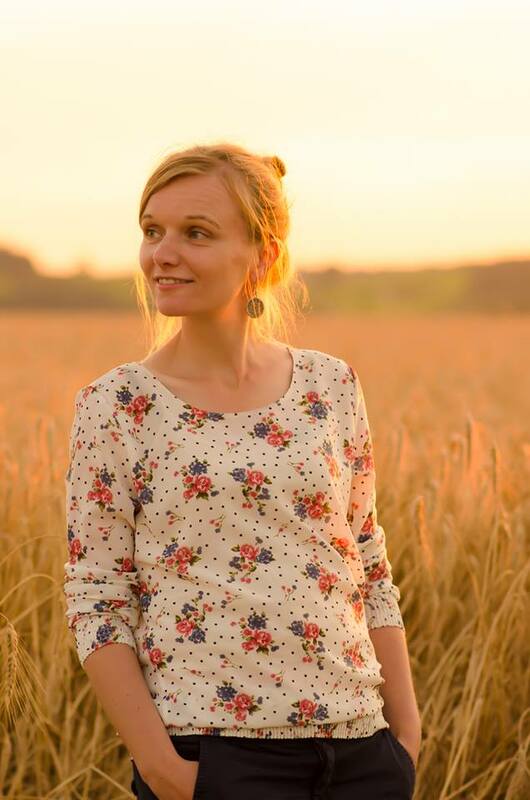 I’m happy that I could contribute in a very small way as a visitor to a sustainable way of observing wild animals in their natural environment. Our “Muriqui Eco Tour” started at the bus station Barra Funda in São Paulo. From there we took a bus of the bus company Cometa to São Miguel Arcanjo. The journey takes about four hours. And importantly, there is only one bus a day to São Miguel Arcanjo. We paid 55,40 R$ for each ticket. We bought the ticket at the ticket desk at the bus station in São Paulo. It is also possible to buy tickets online on Clickbus or Brasil by Bus. In São Miguel Arcanjo we got picked up by the Associação Pró-Muriqui. We stayed in the Carlos Botelho State Park for two days. Our accommodation was kindly organized by the Associação Pró-Muriqui. For one night we paid 200 R$ for two person. We really liked our accommodation. It was a small hut in the middle of a natural forest paradise. So we were quite happy to stay there for two days. Fantastic report congratulations on the detailing and sharing of your experience in Brazil, I live in Itu / SP about 2hrs from the Carlos Botelho State Park in an industrial city with easy access to parks and sites for observation, a remark Minas Gerais and São Paulo are from the Southeast of Brazil. Thank you so much Sergio for your comment and I’m very happy that you like my report about the Southern muriquis. It was indeed a very special animal encounter! The Carlos Botelho State Park is a natural paradise and it was such a privilege to visit the muriquis there. I really have to visit this special place again!